Take your running to the next level. The easy-to-use Forerunner 25 Running Watch tracks distance, pace, heart rate and personal records. Stay connected on your runs with smart notifications so you'll never miss a call or text. When you're not running, you can still record progress with activity tracking to count your daily steps. The included heart rate monitor allows you to train with heart rate zones so you know when to push it on that last mile or when to reign it in. It also provides more accurate information about your calories burned. Fitness progress doesn't stop after your run. Forerunner 25 keeps track of your daily steps as well, whether you're indoors or outside. Having a Forerunner grants you exclusive access to Garmin Connect, where you can track your progress and earn virtual badges for extra motivation. You can also join online challenges and connect, compete and compare with friends and family. 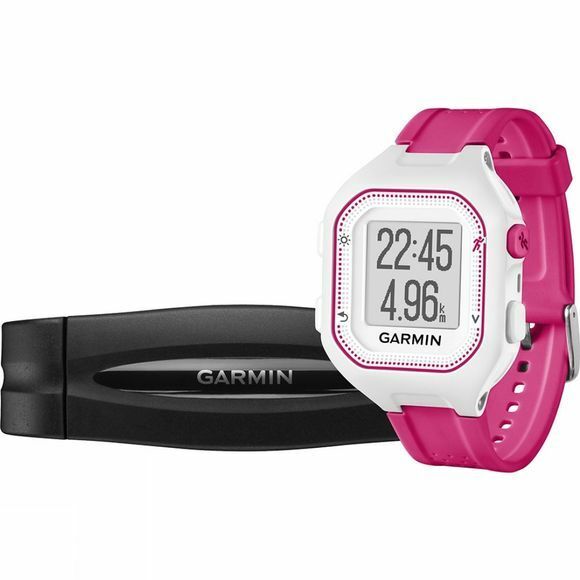 Take the next step as a runner with this easy-to-use Garmin Forerunner 25 GPS watch that tracks how far, how fast and how long you're running. Stay connected on your runs with call and text alerts when paired with a smartphone. Heart rate compatibility allows you to train with heart rate zones so you know when to push it on that last mile or when to reign it in. It also provides more accurate information about your calories burned. Fitness progress doesn't stop after your run. Forerunner 25 keeps track of your daily steps as well, whether you're indoors or outside. 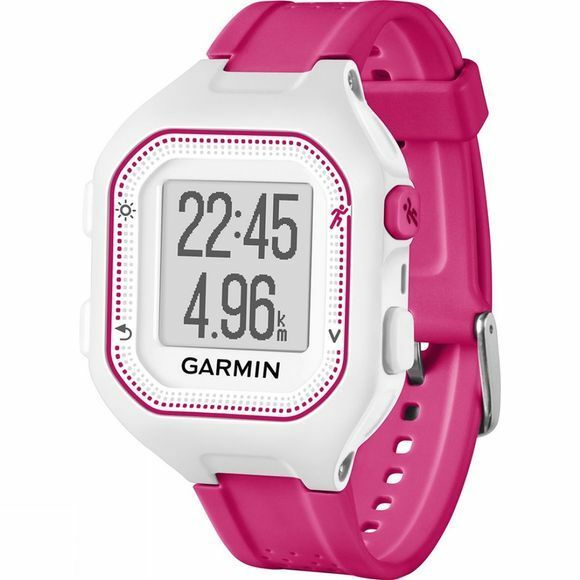 This HRM bundle comes with the additional Heart Rate Monitor strap included.